It is hot, and it is certainly humid. It could be worse, I am told, and there are definitely some redeeming qualities of Roman June. One of which is that it is not Roman August, and I know I will be home for that! 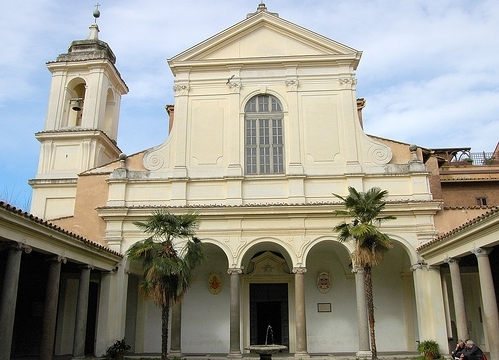 The academic year of the Angelicum was more or less set in the time of St. Thomas Aquinas, though the university’s origins are with the 16th century House of Formation for the Dominican Order. Class begins mid-October and end in May; the entire month of June is set aside for exams. By university statute, they happen in June, the whole of June, and no month but June. Naturally this means that most are scheduled between late May and early June – I was in finals mode for a month, but I have a couple of weeks of freedom to enjoy the City. Two experiences illustrate how to spend these Roman summer days. Sunday, June 13 – An American friend and I decided to head to St. Peter’s for mass. Rather than rushing across town for the 10am, however, we opted for leisurly morning starting with cappuccino and cornetto (croissant with Nutella filling) at my favorite local bar, Café San Celemente – literally across the street from the Basilica San Clemente. We ventured over to San Pietro just in time for the Sunday Angelus, a brief prayer and address by the pope. While there we encountered no less than three different people or groups known to one or the other of us, including one from the states just in Rome for the week! We made it inside for an early afternoon liturgy at the St. Joseph chapel. We spent the next couple of hours touring the basilica and piazza, tourist shopping on the Via della Concilizione, eating pizza by the slice, and then a holy hour devotion at the San Lorenzo youth pilgrimage centre nearby. What could have then been a 30 minute bus ride home turned into a four hour walk along the Tiber with generous time spent at a riverside bar set up for the summer, complete with comfortable lounging couches along the riverwalk. 14 hours out and about, with the only plan for the day being the Eucharist! Saturday, June 19 – A Danish friend and I decided to get together for coffee and some conversation about mid morning. This time we met near the famous and picturesque Café della Pace, which is the quintessential Roman café – cobblestone street, outside seating, low traffic and a church nearby, all within a couple blocks of Piazza Navona. It comes with quintessential pricing too, so we opted for a humbler, and homier, bookstore/coffee house across the street that charges no more to sit down than to take your coffee at the bar. Two hours later we wander to the Pantheon for lunch on the steps, taken from a pizzeria popular with the municipale – the Roman city cops. A meander through the city north takes us to the Piazza del Poplo and up to the edge of the Villa Borghese overlooking the piazza for some excellent people watching and a view of the city. From there we part ways and I wander back along the Viale Gabriele D’Annunzio to Chiesa Treinita dei Monti – famous as the church a the top of the Spanish Steps – and the Via Sistina to Maria Maggiore before heading back home. By A.J. Boyd in La vita Roma on June 19, 2010 .